This supplemental package contains modified pFUS array vectors and destination vectors that are designed for use with the Golden Gate TALEN and TAL Effector Kit. This kit consists of 9 individually packaged plasmids, which are shipped as bacterial stabs at room temperature. Individual plasmids can be ordered at $65 per plasmid, and will be shipped as bacterial stabs. This supplemental package contains modified pFUS array vectors and destination vectors that are designed for use with the Golden Gate TALEN and TAL Effector Kit. These modified pFUS vectors can reduce the number of module plasmids and improve the success rate of Golden Gate assembly. 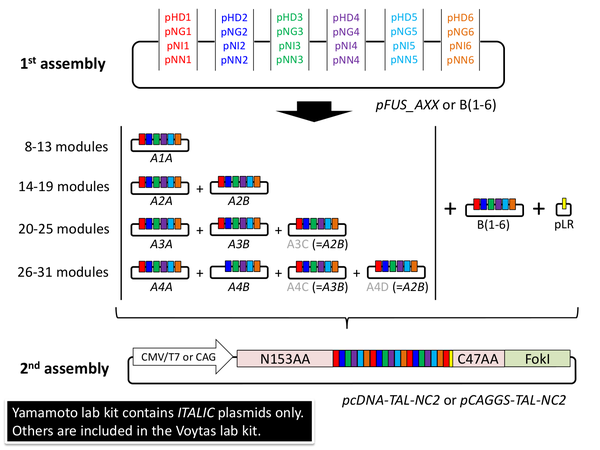 Destination vectors, pcDNA-TAL-NC2 and pCAGGS-TAL-NC2, are mammalian expression/mRNA synthesis vectors containing unique shorter N- and C-terminal domains (N153AA, C47AA). Please note that the Golden Gate TALEN and TAL Effector Kit is required to use the plasmids in this accessory pack. Protocol for TALEN construction and evaluation as described in the article. "The plasmid kit used for building TALENs and TALE-TFs was a gift from Takashi Yamamoto (Addgene kit #1000000030)"